The Nigerian Navy said it had arrested a suspected member of the Niger Delta Avengers. This is contained in a statement signed by its Director of Information, Commodore Christian Ezekobe, and made available to newsmen in Abuja. According to Ezekobe, the suspect who was picked up on July 11 at about 11am, is believed to be a major logistics supplier to the group which had claimed responsibility for attacks on NNPC and Chevron pipelines in the region. “The arrest was made following a confessional statement obtained from an earlier arrested suspect who gave details of the involvement of other collaborators in the attacks. “Preliminary investigations also revealed that the suspect recently supplied 10 batteries, five large coils of wire and other materials purportedly used for the attacks,” the director said. 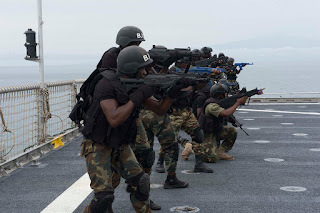 The Navy said it would continue to partner with sister security agencies and members of the public to eliminate all forms of economic sabotage such as vandalisation of pipelines and piracy.